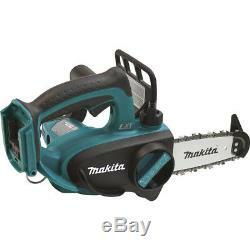 Makita XCU01Z 18-Volt 4-1/2-Inch LXT Lithium-Ion Cordless Chain Saw, (Bare-Tool). Makita-built motor delivers 980 FPM for increased cutting speed. 4-1/2 guide bar is ideal for limbing. Tool-less chain adjustments for convenient operation and maintenance. Zero emissions and reduced maintenance. Compact and ergonomic design at only 16-5/8 long. Weighs only 5.4 lbs. With battery (battery not included) for reduced operator fatigue. Electric brake for maximum productivity. Adjustable automatic chain lubrication with large oil reservoir. Built-in tip guard is engineered for increased convenience. Large oil filling port with view window allows operator to easily add and check bar oil level. Retractable metal hook attaches to rope or harness for convenient transporting. Equipped with Star Protection Computer Controls¢ to protect against overloading, over-discharging and over-heating. Only use genuine Makita batteries and chargers. What's in The Box. 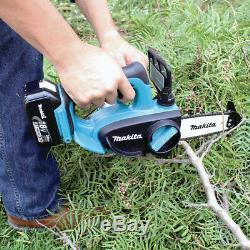 (1) Makita 18V LXT Lithium-Ion Cordless 4-1/2-Inch Chain Saw (Bare Tool). SECURE & HASSLE FREE SHOPPING. All our sales are backed by a 30-Day Satisfaction Guarantee. Products shown as available are normally stocked but inventory levels cannot be guaranteed. The item "Makita XCU01Z 18-Volt 4-1/2-Inch LXT Lithium-Ion Cordless Chain Saw, (Bare-Tool)" is in sale since Tuesday, May 24, 2016. This item is in the category "Home & Garden\Tools & Workshop Equipment\Power Tools\Other Power Tools". The seller is "factory_authorized_outlet" and is located in Ontario, California.